Will Lance ever fess up and face the truth? 25-Oct-2012 by THF in Hoot's Corner | Comments Off on Will Lance ever fess up and face the truth? Like it never happened: Lance Armstrong’s record seven Tour de France titles will be stricken from the books. 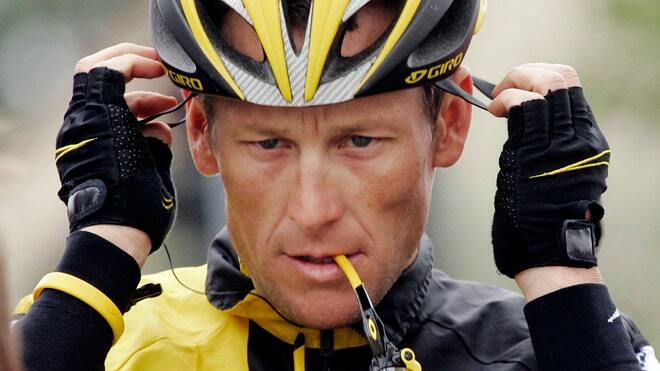 Lance Armstrong has been stripped of his seven Tour de France titles and banned from cycling. Pat McQuaid, president of the International Cycling Union, the sport's governing body, said Armstrong, "deserves to be forgotten." Armstrong's life story is, from a psychological perspective, less noteworthy for its triumphs than its tragedies, and his racing away from them seems to have failed, as it always does. In life, the truth always wins, no matter how cagey a person might think he is in outsmarting it. Armstrong's truth-and likely the driving force in his winning seven Tour de France titles while allegedly injecting himself with steroids and mainlining his own blood-is that his father abandoned him at age 2. Â To this day, Armstrong has refused to meet him. Â His mother then married another man with whom Armstrong did not get along, and with whom he has had no contact for years. An abandoned and forgotten boy is-absent extraordinary healing-forever an abandoned and forgotten boy. Â Two years old is plenty old enough to be torn apart at the level of the soul by the abrupt severing, without explanation, of a father-son bond. Â It is plenty old enough to be shredded by the haunting suspicion that one is unworthy and unlovable. Â It is plenty old enough to set the stage for a decades-long race for enough fame and adulation to fill the emotional black hole inside you that keeps threatening to make you disappear into it. Armstrong's truth-and likely the driving force in his winning seven Tour de France titles while allegedly injecting himself with steroids and mainlining his own blood-is that his father abandoned him at age 2. And, so, Armstrong seems to have pedaled faster and faster. Â And if his teammates and adversaries wondered how a man could be so driven as to declare himself a winner when he was not, again and again and again, to have seemingly no compunction about celebrating hollow victories, and to maintain a synthetic fiction in the face of seemingly incontrovertible fact, they need only remember the hollowness inside that man, born of being a forgotten boy-that black hole and the threat of complete psychological disintegration it represented to him, if only unconsciously. So, he is likely now to try to reinvent himself-perhaps by starting his own cycling league, perhaps by starring in a reality show. Â Anything, but anything to avoid the reality that he was unloved by the first man in his life. And it is not lost on this psychiatrist that Pat McQuaid, president (father, if you will) of the International Cycling Union, would stumble into repeating the biggest psychological trauma in Armstrong's life, by calling him "forgettable." Everything in the world and every person in it and every act is explainable. Â And, very often, the explanations are very sad, indeed. You see, to truly Livestrong after being injured catastrophically as a boy by abandonment requires looking at your pain, sitting with it, really feeling it, not trying to outdistance it-which is impossible and a race to oblivion. Â It requires realizing that you were always loveable, even if you were unloved, and that false fame and a Superman-lean frame will only separate you from that healing reality, which many people correctly call God. And, so, it is with that knowledge that I wish Lance Armstrong Godspeed on his continuing journey toward the certain knowledge that he was always a worthy person, even if his father was too broken to love him. That is the only race worth winning in Lance Armstrong's life, and it is the beauty of this miraculous existence of ours, that it can still be won.